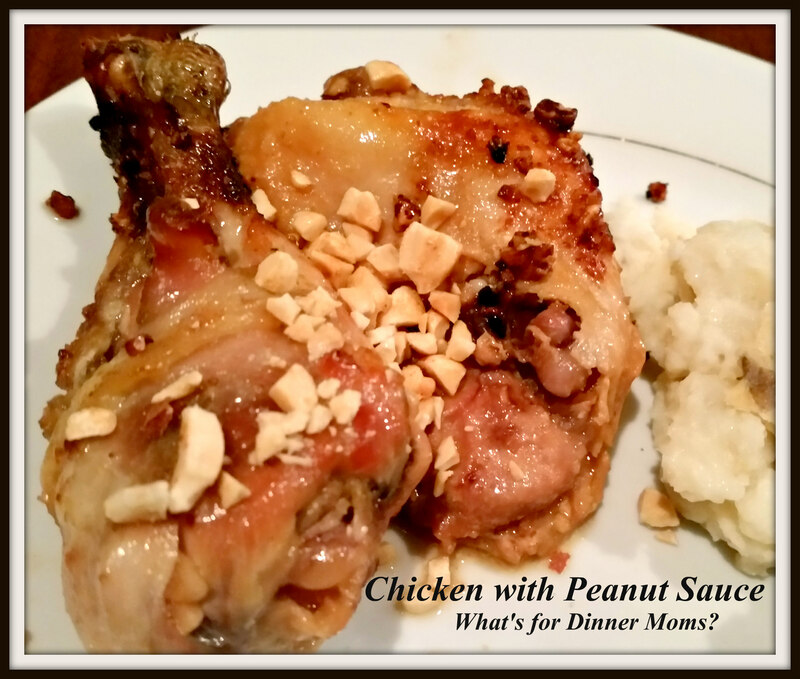 Chicken with Peanut Sauce – What's for Dinner Moms? Third time will be the charm today, right? I have lost this post two times already and my revert to saved is not working to restore what I have saved. UGH! But, here we go, again…. We are back to the busy, busy school schedule just like everyone else. The one thing I am grateful for is that my son decided not to try wrestling. I fully supported him wanting to do something physical but other than my fear of him getting hurt (or hurting someone else) it was the question of how I was going to fit one more thing into an already packed schedule. After he thought about nights with his cello lessons, youth orchestra practice and three Science Olympiad practices per week he thought it just may be too much to add wrestling every day after school. Whew! I am glad he made his own decision on that one. Someone asked me about meal planning the other day. As I mentioned before I plan meals one month at a time (we get paid once a month) and I do one HUGE grocery shop once a month and then just shop for fresh produce, milk, dairy and sales throughout the month. I have been doing this for about three years now so I pretty much know when the sales cycles are for our stores. Sometimes they surprise me but I know the rock bottom sale prices for items I use regularly. Instead of buying just one or two of the items I know that certain items are on sale every 6-8 weeks. So I plan that if we eat three boxes of cereal each week and they are, on average, on sale every 7 weeks I will buy 21 boxes of cereal when they hit the rock bottom price. I know my family will eat that much cereal in 7 weeks until they are on sale again. Soup is the tough one because my son’s favorite brand is only at its lowest sale price usually two times a year so I buy 100 – 120 cans. He eats soup quite often for lunch if there are no leftovers from dinner. So, back to planning. I sit down with my pantry list, grocery ads, Pinterest and food magazines and start planning meals for the entire month. I generally try to stick to a schedule in planning – Monday is slow cooker soup or soup day, Tuesday is slow cooker casserole or casserole day (one of my busiest days so meals HAVE to be made ahead of time), Wednesdays is meat and potatoes day, Thursday is breakfast for dinner, and Friday is pizza or sandwich day. Over the weekend I try to make heartier dishes such as lasagnas or roasts, and get myself prepped for the week ahead. Now, I don’t always make what I have planned each day but I try to follow a basic plan so I know 2-3 days ahead what I have planned for meals. I know to take out 2-3 meals worth of meat at night to thaw and what fresh items I am going to need from the grocery store so I am not running there every night (and spending more money) to pick up an ingredient or two for dinner. The easiest thing is to find what works best for YOU! Do plan ahead a bit. If three days works for you start with three days. Some people do it by the week, one month works for me because I like lots of options. But, just jump in and try it. If I can help you at all please ask questions! Making meals should not be the worst part of your day! This recipe is a version of a Weight Watchers recipe that I have had forever. I don’t know where the original was from but I like to pull it out every once in a while to make. I am not a big fan of peanut butter in any form. I am learning to like natural peanut butter but Chicken with Peanut Sauce is not my favorite dish. But, I did like this dish more than some of the other dishes I have tried. It wasn’t too sweet or too hot. The kids loved it and my son even took some for lunch to school the next day. We just took it off the bone and mixed some rice with it in a thermos for him. I served this with rustic mashed potatoes on the side, carrots and a green salad. Mix chicken and all ingredients in the top portion of the recipe in a plastic Ziploc bag. Shake to coat and mix well. Let meat marinate in refrigerator at least 4 hour up to overnight if needed. Preheat oven to 350 degrees. Place chicken in a 13 x 9 baking dish coated with non stick spray. Bake for 40-45 minutes, depending on thickness of chicken pieces. Rotate chicken several times during cooking. Remove one of the larger pieces and make sure it is completely cooked to the bone. While chicken is cooking whisk all Peanut Sauce ingredients, EXCEPT for the crushed peanuts, in a bowl. Once the chicken is cooked serve with a side of peanut dipping sauce and crushed peanuts over the top, if desired. I like dishes with peanuts. I think it’s an Asian thing. we have that dish here in the Philippines called kare-kare. somewhat near to a curry texture but it came from a peanut sauce. Hmm. Now I have to go look that up! My kids love tasting true ethnic recipes. check this out. u can find one of the best kare kare and a crispy pork knuckles and garlic on top. delicious! This sounds great! I make something similar with noodles. Sometimes my post vanishes into thin air and not very funny at all. The chicken dish looks good. I think the peanut will add some crunchy bite to it. Thank you. It was a very frustrating day trying to post. Although I am a peanut butter fan, I agree with you, this one doesn’t sound too great. But I love your effort!! Thank you. It wasn’t my favorite but the kids like it. So to each his own….